One of the most unique lads in North Simcoe is Allan Mosley, the 11-year-old son of Mr. and Mrs. Robert Mosley, R.R. 1, Wyebridge. Know any other boy hereabouts who has a two-goat team? 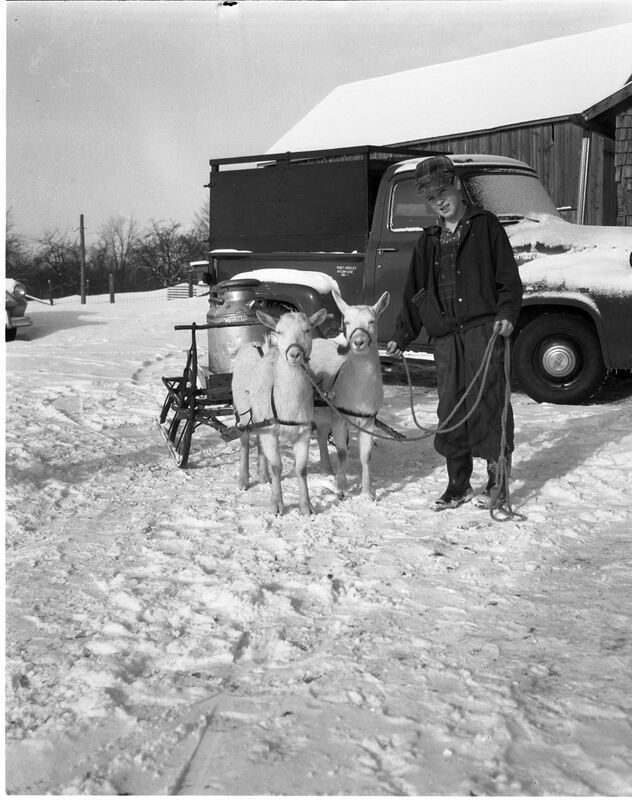 Allan uses the team to sand the steep hill leading to his father’s farm and to haul milk cans to the nearest sideroad. Goats are Linda, left, and Lucie. Or is it Lucie, left, and Linda? Everything’s up to date at MPDHS as well as in Kansas City, and this cut-away torso is the latest equipment added to the school for the benefit of students. Various organs are detachable for closer study by Grade 13 Zoology and Grade 10 Science students. Here, Warren J. Jacklin, left, explains some parts of the human body to Gail Brand, Grade 10E, while principal L. M. Johnston looks on. 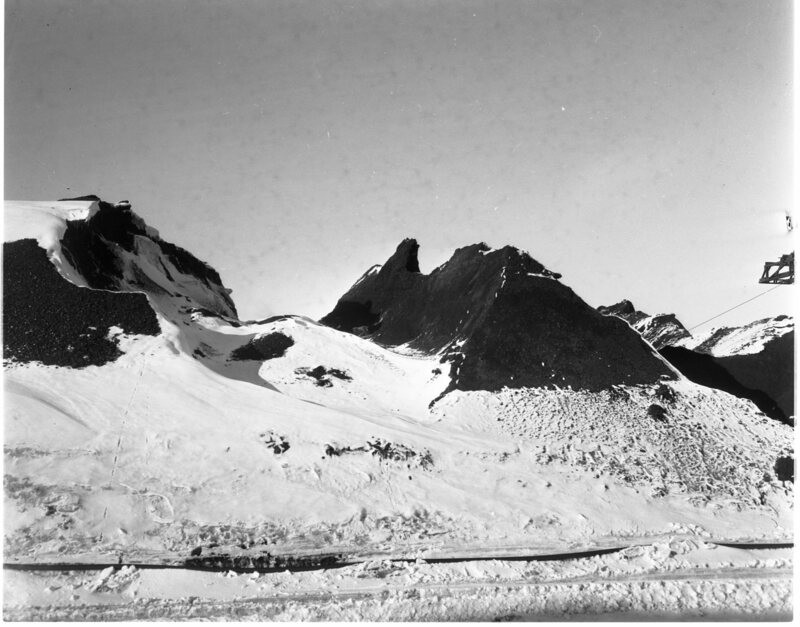 With sub-zero temperatures and howling winds prevalent this year; not many parties have attempted to climb Midland’s “Black Mountain” range in recent weeks. No “mountains” like these near Midland, you say? 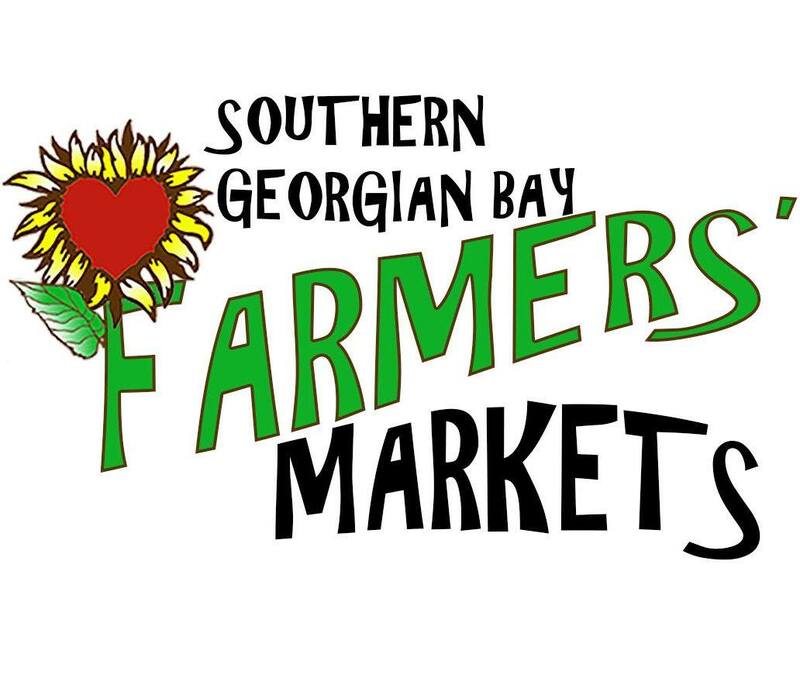 You’ll find them between the CNR tracks and the bay, on Century Coal Company property. One of these ten girls will be this year’s “Queen of Hearts” at MPDHS. Five of them will be eliminated in a preliminary contest at Midland’s Roxy Theatre tomorrow night. 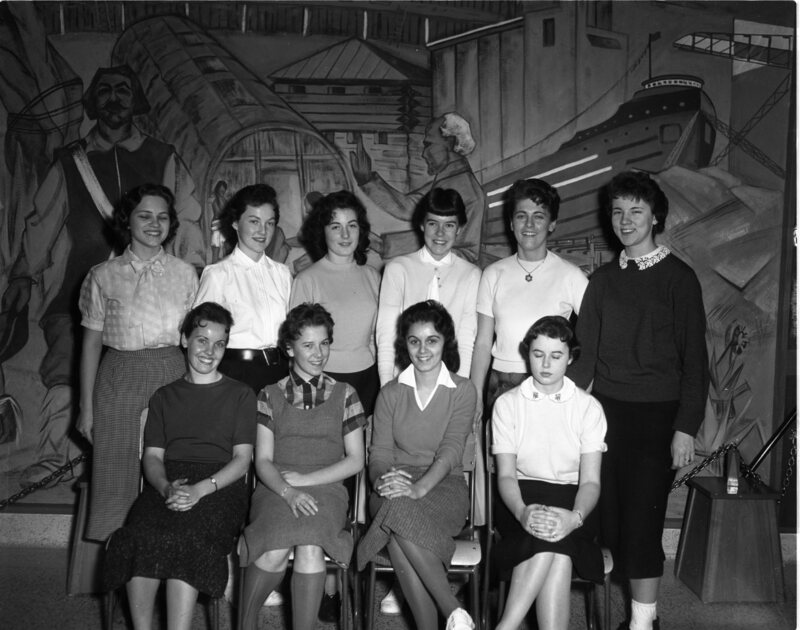 Left to right are, front row, Anne Hamilton, Judy Bellaire, Carol Van Luven, Karen Robinson; back row, Marie Gignac, Rosemary Shiels, Gisele Bezner, Bev Scott, Annette Ducaire, Carol Cowan. This has been a real old-fashioned winter for young Canadians, from Newfoundland right through to the Rockies. 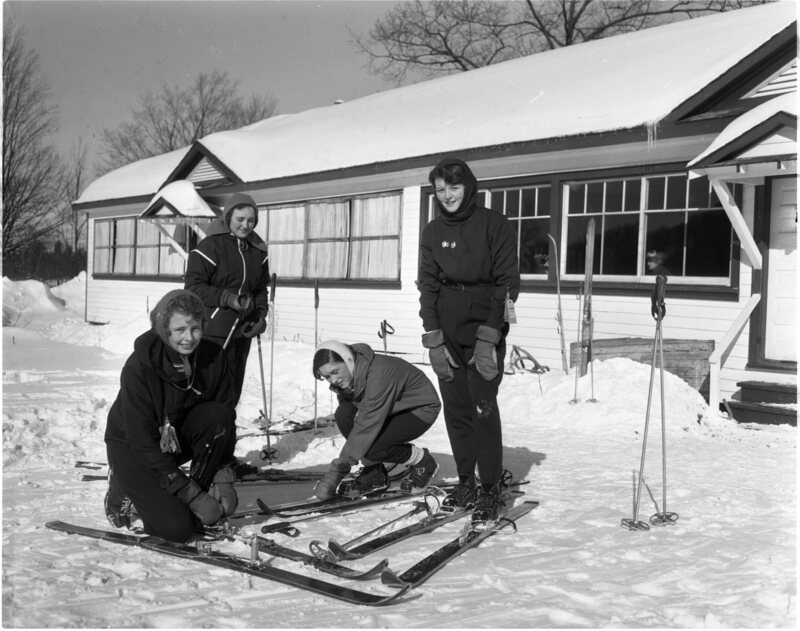 Getting some of the color in their cheeks that doesn’t rub off are Susan Swan and Betty Jean Watkinson (fixing skis) and Susie Sutton and Gayle Ellison. The four Midland girls were among the hundreds of skiers, from local and distant points, who took advantage of near-perfect conditions at Midland Ski Club on the weekend. Temperatures both days hovered around the zero mark, even in mid-afternoon. Simcoe East member, Dr. P. B. Rynard of Orillia receives a memento of his visit to Midland Thursday night, from Lion Gilmour Nesbitt, left. At right, Lions Club President Harold Humphries looks on. Dr. Rynard spoke to Midland Service Clubs, describing his recent world tour with Prime Minister Diefenbaker and party. Toronto Alderman Philip Givens was the guest speaker at an organizational meeting of the East Simcoe Liberal Association held in the Georgian Hotel, Midland, Tuesday, Jan. 27. 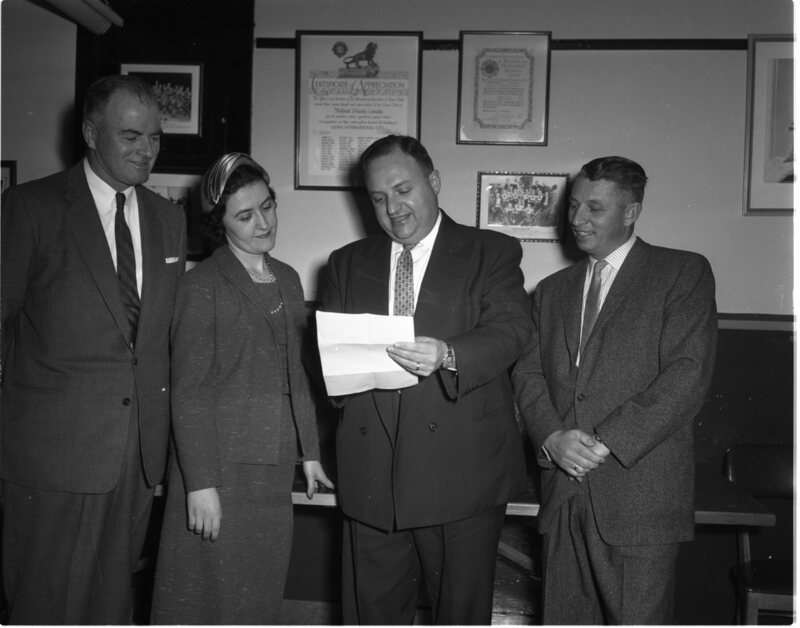 Left to right are John Maclsaac, Orillia; Mrs. Ross Heidman, Orillia, secretary of the association; Ald. Givens; and riding president Jack Andre, also of Orillia. Smiling faces above reflect the good news found in the reports presented at the annual meeting of the Midland Chamber of Commerce Monday night. 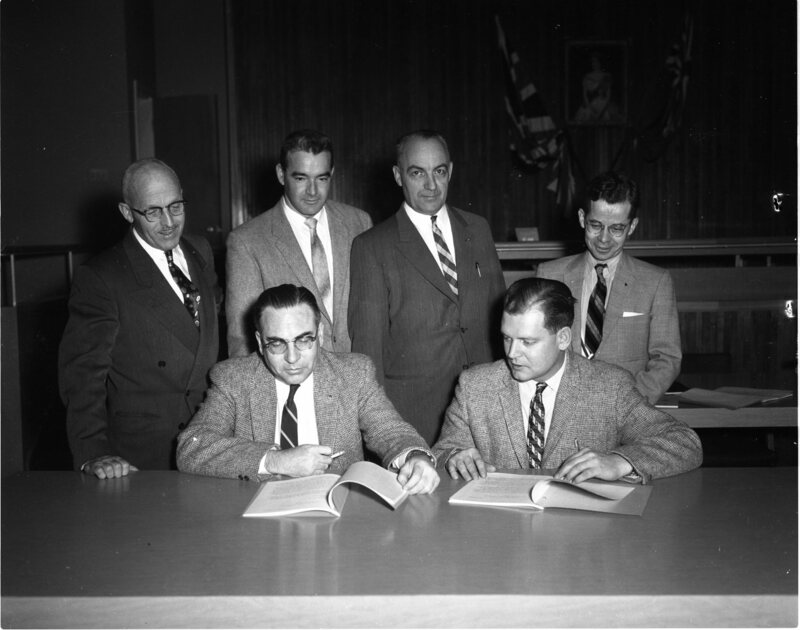 Seen are, left to right, front row — R. B. Moffatt, secretary-manager; Frank Bray, retiring president; back row— directors Ted Lounsbery, Ken McCaughen, Harvey White and Dave Finch. Mr. White was later named 1st vice-president of the Chamber. A roller bracket on the Goss newspaper press which broke in three places Wednesday afternoon brought publication of the Free Press Herald to a halt. 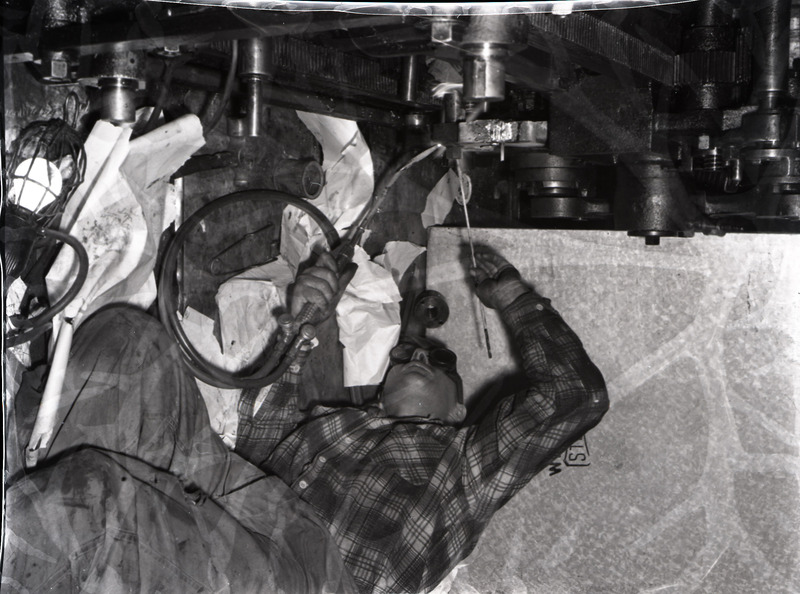 Here Orville Puddicombe of Fenton’s Welding Service is pictured as he affected temporary repairs to the bracket. The press was ready to run again about 11 p.m. Wednesday. Photo by Rolphoto. Two prime requisites for a successful ski enterprise nowadays are plenty of snow and a good tow. 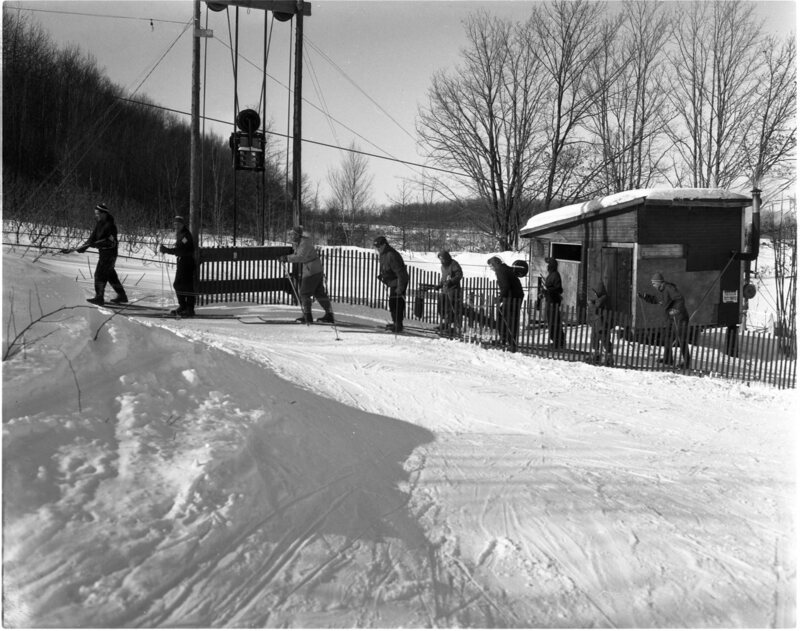 Midland Ski Club has snow to burn, literally, and the tow has been greatly improved this year. 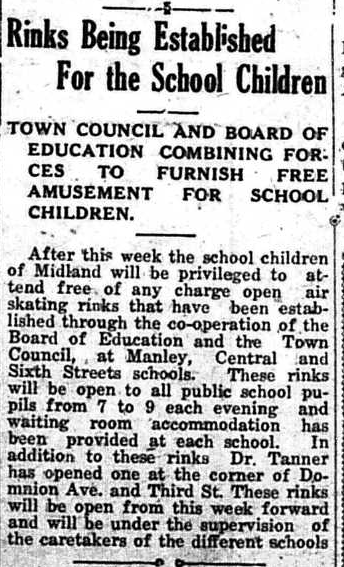 From a 1930’s Midland paper, when we had control of our own schools. Headline from the Midland Free Press of February 4th, 1959; Two Gun Wielding Thugs Kidnap Midland Druggist. A prominent Midland resident was robbed of $12 at gunpoint on a lonely Tiny Township side road early Monday morning. The Midlander was forced inside a car on a Midland street while he was on his way home from visiting a friend. Midland police said druggist William Irwin, 326 Manley Street, was accosted shortly after midnight Sunday as he approached the corner of Elizabeth and Manley Streets, a car pulled up alongside. Police said a man got out wearing a face mask and ordered Mr. Irwin into the car. Turning east on Elizabeth, the car then turned south on William and proceeded west on Highway 12. The driver of the vehicle also wearing face mask then drove across a concession to Highway 27. The vehicle continued on west until it reached a point about 2 miles past the Midland drive-in theatre. At this point police said Mr. Irwin was forced, gun at head, to turn over the money he had on his person which happened be $I2, he was also relieved of the keys to his King Street store. Mr. Irwin was then ordered out of the car, which drove away leaving him stranded on the concession road. Walking about three-quarters of a mile, Mr. Irwin reached Les Davidson’s house, where he phoned Midland police. At 1:15 a.m. Midland police and members of the OPP detachment at Victoria Harbour picked up Mr. Irwin while a watch was kept on the drug store. 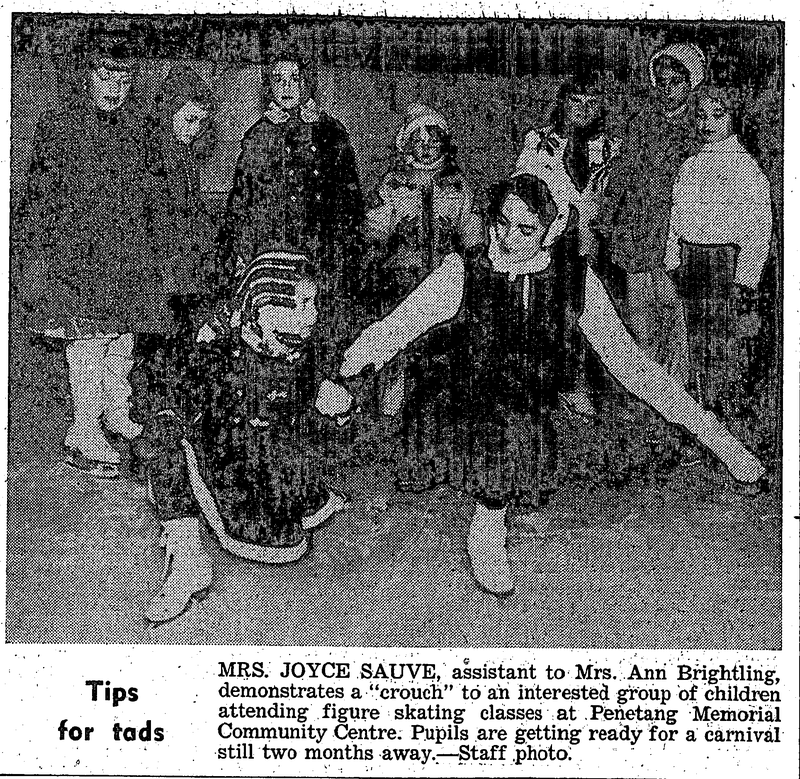 Headline from the County Herald of February 6, 1959; Program of Winter Work Under Study in Penetang. Penetang may institute a “winter work program,” with government participation if discussions at last Monday night’s council meeting materialize. Mayor Jerome Gignac initiated the discussion, stating he had attended a meeting last week in Midland during which he learned much about this type of program. He said government sources would provide up to 75% of the labour costs of approved programs. A native of Elmvale, Hugh Ritchie died in Vancouver last week after undergoing surgery for cancer of the liver. A University of Toronto engineering graduate, Mr. Ritchie attended schools in Elmvale and Barrie. He was one of the stars of the early U of T football teams. He played for the Varsity team that won the first Grey Cup in 1909 and was considered the best kicker in Canada in that era. When Penetang council talked Monday night about installing a new ceiling in the council chamber of the town hall as part of a winter work program, they little thought they would be in the same building early Tuesday morning surveying fire damage which makes more than a new ceiling essential. The blaze, which caused damage estimated as high as $10,000, was discovered about 2 a.m. by a passing motorist, who turned in the alarm. Ten Years Ago This Week; Father T. J. Lally S.J. and Father D. A. Lord S.J., were conducting interviews for prospective members of the cast of the Salute to Canada pageant which was to be staged at Martyr’s Shrine in the summer. The two clergymen estimated that a cast of 350 would be required for the project * * * Annual meeting of St. Andrew’s Hospital was informed that the deficit on the 1948 operations would amount to $10,606. In 1947 the deficit had been $13,263. * * * Pointing out that average age of Canadian-owned lake vessels was 42 years, Simcoe East member Wm. A. Robinson contended that it was imperative that effective steps be taken without delay to replace the ageing Canadian lake fleet. He recommended that the federal government assist the Canadian shipbuilding industry. * * * Fire caused by an over-heated stove completely gutted the Roman Catholic Church at Honey Harbour Members of Waubaushene Volunteer Fire Brigade fought desperately to save the concrete and frame structure but were unable to control the flames. * * * Work had commenced on the construction of a new 196-foot wooden dock, jutting out into Penetang Bay parallel with the existing cement dock. * * * No directors were elected at the annual meeting of Midland Recreation Council. Instead, a committee of five was appointed by the meeting to interview clubs and municipal organizations to determine whether these groups favored the continuance of the organization. Sometimes an ill wind can blow some good. That’s what Midland Chamber of Commerce is hoping in connection with the Canadian Marconi wireless station, slated to be shifted from Midland to Wiarton in the not-too-distant future. In his report to the public affairs committee at the annual meeting of Midland Chamber of Commerce Monday night, Hugh Blair said his committee has “most reluctantly recommended to the directors that the file be closed on this question.” Noting that the chamber had protested vigorously the closing of the Midland station. Alderman Bill Orr recommended that every effort be made to gain control of the property to replace the popular lookout across William Street that had been fenced off by the property owner. Also causing the chamber of commerce some concern is a new site for the tourist information booth. The old one was located for many years on property owned by the town near the King-Yonge intersection, which is also the Junction of Highways 12 and 27 (Junction later moved west to Hwy 27), main entrances to Midland. The property has recently been purchased by private interests (Les Taylor). 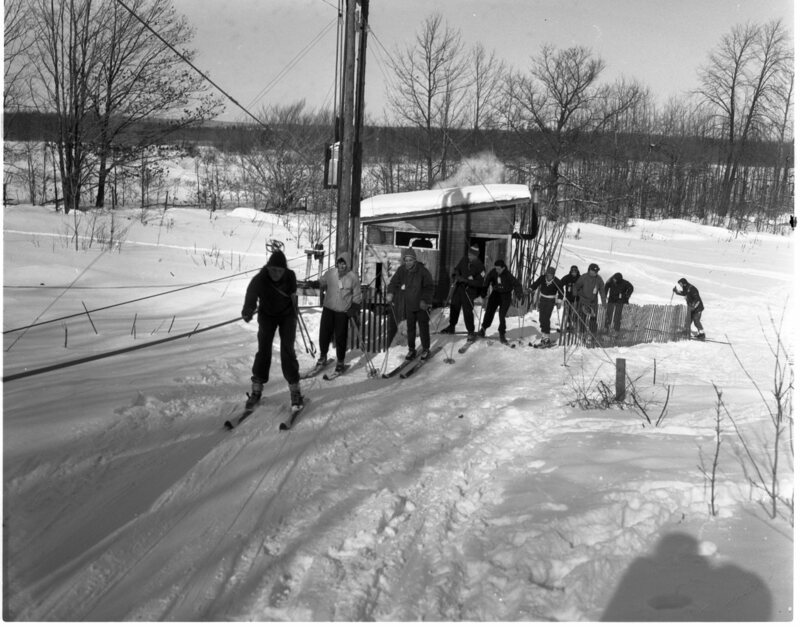 President Frank Bray noted at one time a joint booth to serve both Midland and Penetang had been proposed for Firths Corners, at the Junction of Highway 27 and County Road 6. Department of Highways officials have vetoed this proposal. MOONSTONE — School Area No. 1, Medonte Township, has eight schools and a total of 10 teachers, including the music instructor. Mrs. Alma Caston of Craighurst is the teacher of the senior room, Hillsdale school, and Mrs. Margaret Cathcart of Craighurst teaches in the junior room. At Mount St. Louis school, Mrs. Dorothy Miller of Mount St. Louis is the teacher. The teacher at No. 16, Vasey, is Miss Patricia Johnston of Parry Sound. 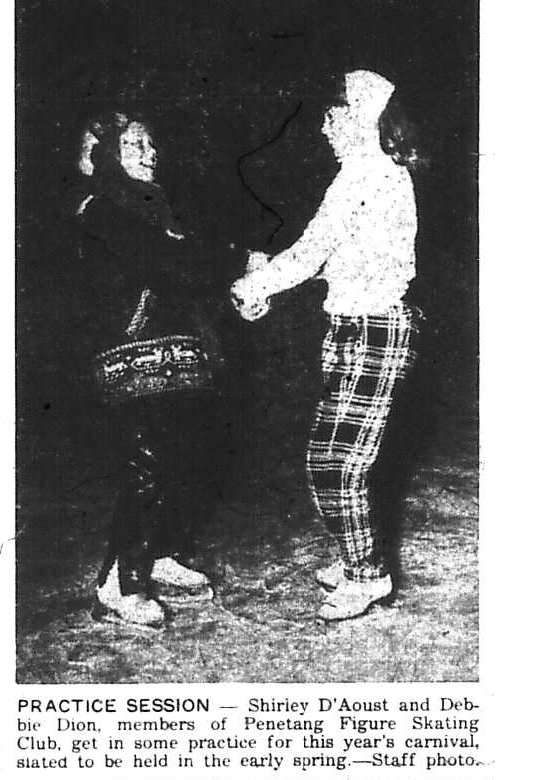 Mrs. Wilma Fallis of Vasey is the teacher at No. 12, Vasey. Miss Janice Edwards of Vasey teaches at Moonstone. Eady school teacher is Mrs. Jean Reid of Eady. Bruce Lush of Tweed teaches at Grenard. The teacher at Hobart school is Miss Allison Harvie of Orillia. Mrs. J. L. Self of Midland is the music teacher for the area. Superior Propane Limited who recently bought out the Midland division of Georgian Bay Propane Ltd. will be making major changes in the spring to the premises at Midland’s dock. This was announced last week by Wilfred Polmateer, newly appointed branch supervisor for Superior Propane in Midland. “The new branch will be servicing and delivering to all of the accounts previously serviced by the Midland division of Georgian Bay Propane,” Mr. Polmateer stated. Jack Blackburn, the former local manager, will be remaining with the new company at least for the present and by mid-summer, we expect to have three additional men on our staff. Postmaster General William Hamilton has announced that a new postal facility is now available for the convenience of the public — curbside mailing. Recognizing that the world of today lives largely in automobiles. The Post Office Department has been experimenting with various types of curbside mail receptacles and a new “Snorkel”, type curb box has been devised. The new installation is a specially designed large-size red mailbox having a funnel receptacle facing the road for motorists, as well as the conventional flap-type opening facing the sidewalk for pedestrians use. Motorists need only draw up to the side of the road, reach from the auto and deposit their mail in the “Snorkel” or funnel receptacle, and then drive on. 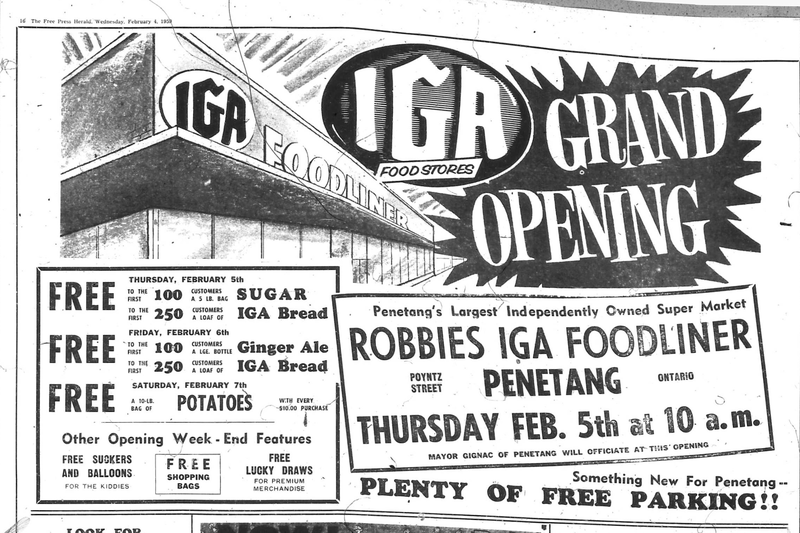 Many years have passed since the name “Strathbogie” was heard in everyday conversation in Midland and Penetang. Nev­ertheless the name is not for­gotten. The big two-masted two-deck steel tug ‘‘Strathbogie”, along with her engine (official No. 134499) was built as the Laval in 1914 by the Smith Dock Co., Southbank, Middlesborough, England. Hull No. 581 for the British Government. Her length was 120 feet, width 26 feet, depth 12 feet, gross 332 tons. She had one coal-burning Scotch boiler and a triple expan­sion engine with cylinders 16-26-43 by a 30-inch stroke. Her hull was painted grey, cabins red and pilothouse white, the stack being black. She was equipped with wireless and carried two davit mounted lifeboats. A powerful searchlight was lo­cated on top of the pilot house. The galley was in the bow and its two bell-mouth ventilators rose just above the boat deck. In 1921 she was sold to the Dominion Towing and Wrecking Co. of Port Arthur and, with her fifteen-man crew came across the Atlantic under her own power. In 1922 she was re­named Strathbogie and in 1925 was sold to the Midland Trans­portation Co., which in 1931 was listed as the Burke Towing and Salvage Co., of Midland. They used her to tow log rafts from the North Shore to the Letherby and Manley Chew’ saw­mills. In 1936 she was sold to the Provincial Paper Co. of Port Arthur who used her to tow pulp wood rafts from the mouth of the Nipigon River to their mill. In 1949 she was sold to the Abitibi Power Co. of Port Ar­thur but has been out of com­mission since 1953. 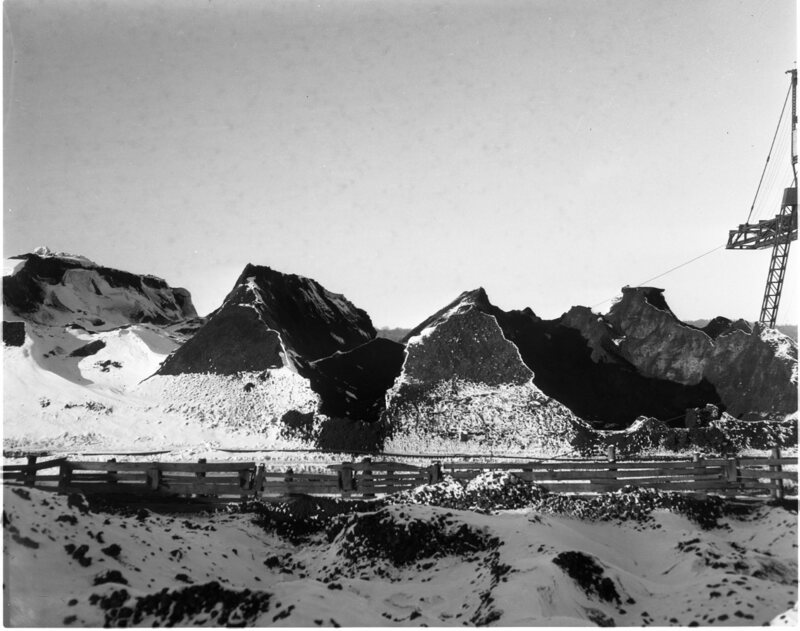 While at Midland she was used each winter to break the ice so that grain-laden steamers could be placed in position for unloading at the elevators. Births – CARRINGTON — To Mr. and Mrs. William Carrington. Waubaushene, at St. Andrews Hospital, Midland, on Friday. Jan. 30, 1959, a daughter. MCDONALD — To Mr. and Mrs. Ray McDonald, at Penetang General Hospital Friday. Jan. 23, 1959, a son. RAMLER — To Mr. and Mrs. Ernest Ramler, Waubaushene, at. St. Andrews Hospital, Midland, on Monday. 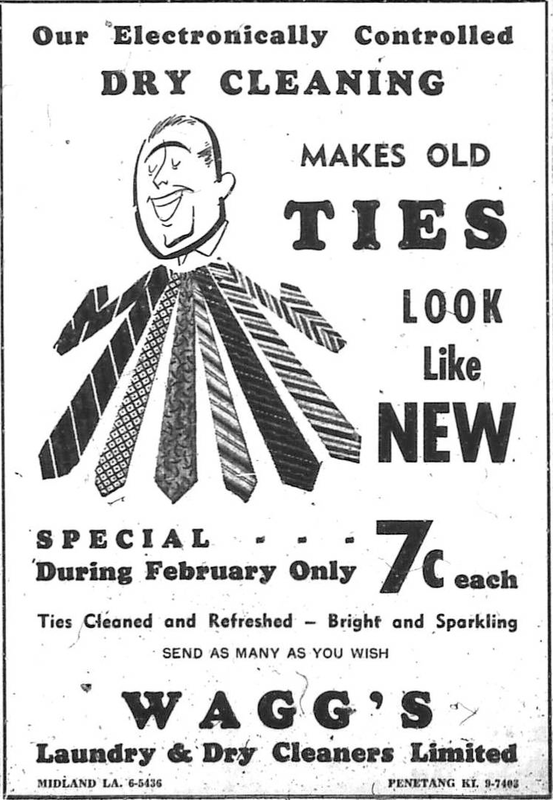 Feb. 2, 1959, a son. STEWART— To Mr. and Mrs. Douglas Stewart. 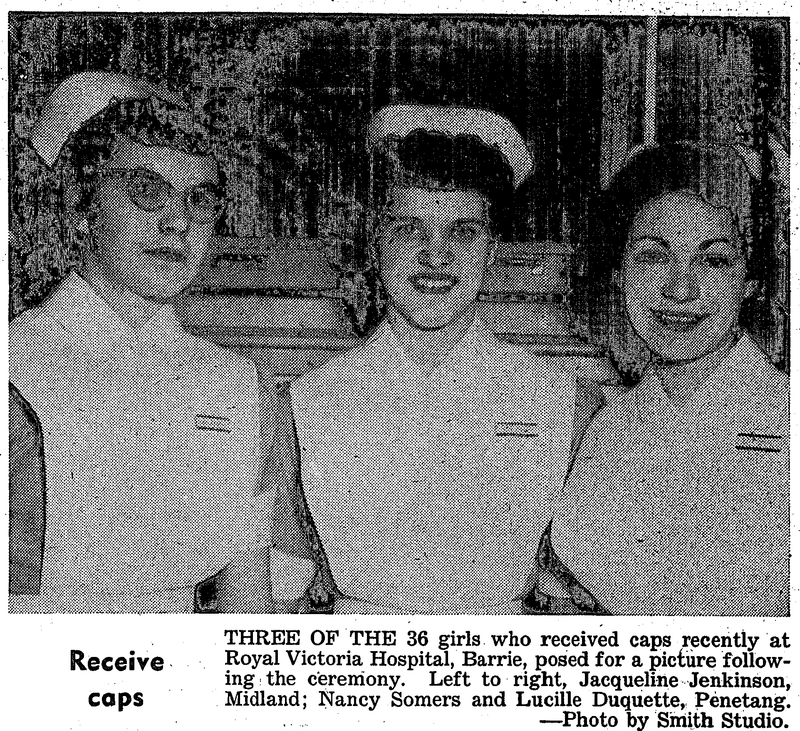 Victoria Harbour, at St. Andrews Hospital, Midland, on Friday, Jan 30, 1959, a daughter. THOMPSON — To Mr. and Mrs. Ross Thompson, 174 Robert Street, Midland, at St. Andrews Hospital, on Sunday. Feb. 1. 1959, a son. WINDROSS— To Mr. and Mrs. Raymond Windross, R.R. 2, Midland, at St. Andrews Hospital, on Thursday, Feb. 23, 1959, daughter. PORT MCNICOLL NEWS – Mary Calvert left Sunday for Toronto where she has secured a position with Canada Life Insurance. * * * Barrett Smith, Toronto, weekended with relatives in town. * * * Gert Neilsen entertained several friends at his home on Saturday on the occasion of his tenth birthday. * * * Weekend visitors of Mrs. J. Calvert were Mr. and Mrs. Bert Calvert, Mount Dennis, Nancy, and Bruce Calvert, Toronto. Mrs. A. Calvert and Jamie spent Monday and Tuesday in Galt. * * * The junior and senior choirs of the United Church and their choir leader were entertained at the home of Rev. and Mrs. G. Nodwell, Victoria Harbour, Friday evening. Mr. Nodwell showed colored slides taken during his visits to Europe and while he resided in Scotland.